Hi there and welcome to my little space. I started this blog in the winter of 2006, shortly after my partner, Jared, and I moved from the Bay Area to his home state of Minnesota. Initially, this space was intended as a way to promote my handmade goodies that I was selling at the time, but I quickly discovered an incredibly thriving and inspiring community of creative souls that I now feel blessed to be a part of. I have learned so much and made many deep and true friendships, which is primarily the reason that I continue to love coming here and sharing my little ramblings with you all. I love to write about food, gardening, crafting, photography, and finding the beauty in everyday life. We now live in a lovely house in Minneapolis with our spastic but snuggly puppy, Freddie, and my gardens that are slowly taking over the backyard. In 2008, I finally picked up my dad's old manual 35mm film camera that I had been toting around since high school. I didn't really know what I was doing, but I fell in love. I was so late to the whole digital thing, that I had mostly just skipped it altogether. (Though, in 2011 I finally caved and bought a DSLR. It's quite nice but I still prefer film) I love shooting film. 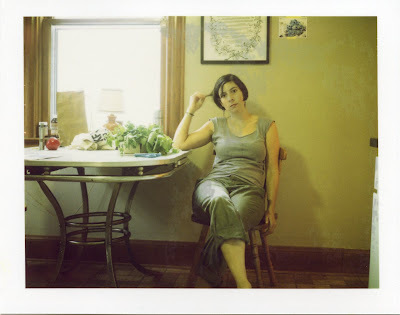 Shortly after my first adventure with the Canonet, I loaded up an old Polaroid camera, and down the rabbit hole I went. Polaroid magic has cast a spell on me. By no means am I an expert, but I always take at least one camera with me whenever I leave the house, and I always have fun. Please take a moment to say hi, I love hearing from readers!